Hover over the row until the + icon and duration for the issue appears. Above the timeline section, click Update Jira. In the dialog that appears, if you're happy with the changes you've made, click Update Jira. You can also move an issue to a higher or lower row in the scope section. This can help you organize issues in both the scope section and timeline section. Moving issues will impact the issue rank in both Portfolio and Jira. Moving an issue that has child issues will move the child issues with the parent issue. Moving an individual child issue of a parent issue will move only that child issue. As discussed, in alpha, you can now manually schedule work your way to come up with a realistic schedule for your teams. But this doesn't mean that the scheduling algorithm that we know is out of the picture. You can still get Portfolio for Jira to create a schedule for your teams, by optimizing your plan. Review the optimized changes more closely by hovering over each change, to see the current value saved in Portfolio, and the new value that will be saved in both Portfolio and Jira, if the changes are accepted. In the example below, the current target end date of the issue is 18 February 2019. 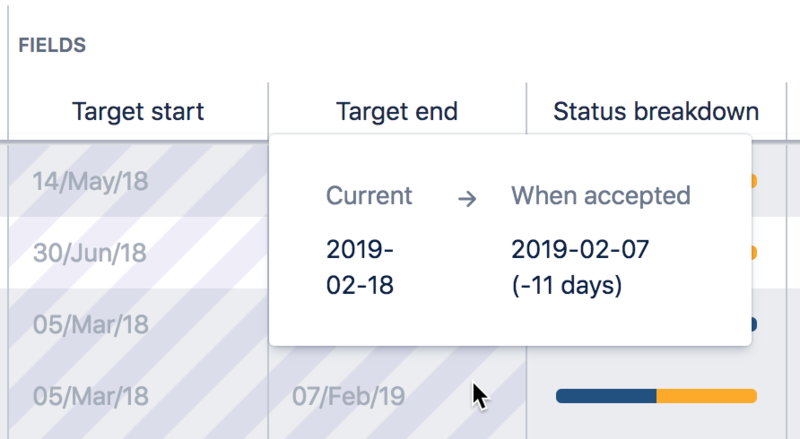 If the optimized changes are accepted, the new target end date will become 7 February 2019, which is earlier than the current target date by 11 days. Click Update Jira. The 'Update Jira' dialog will display. If you're happy with the optimized changes, click Update Jira. The optimized changes will be saved in both the Portfolio plan and your Jira instance. Note that if you don't want to update Jira with the optimized changes, click Revert all changes in the 'Update Jira' dialog. This will discard the optimized changes, and will return to the roadmap view of your plan. To discard the optimized changes, click Cancel. The optimized changes will be discarded, and will not be saved in the plan, nor saved in Jira.